OK-FGS (28478 / 3132) CSA Boeing 737-400,Sep 2008. This is the last 737 Classic to have been built. Like the 737-200, the Classics enjoyed continued sales and deliveries after the launch of the NG. 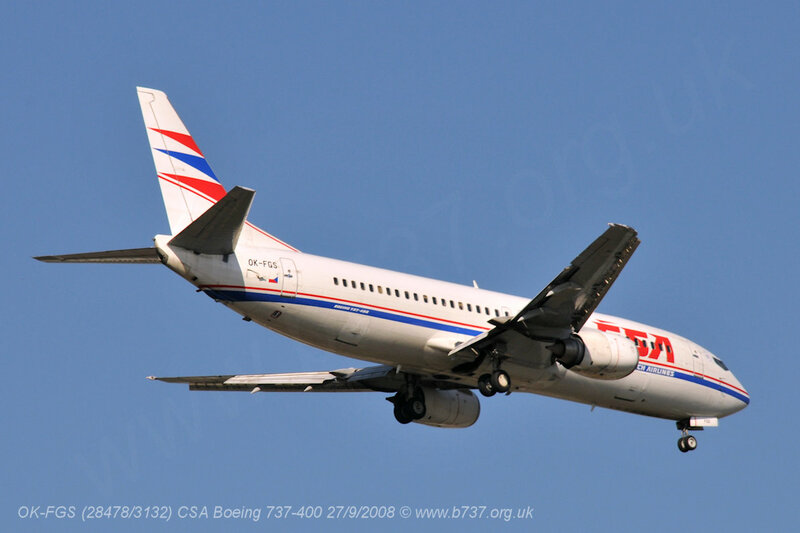 This aircraft, (28478/3132) was a 737-45S for CSA, registered OK-FGS its first flight was 17 Jan 2000, some three years after the first flight of the NG. 737-300 (25609/3130) ZK-NGJ for Air New Zealand, delivered 17 Dec 1999. 737-400 (28478/3132), OK-FGS for CSA, delivered 25 Feb 2000. 737-500 (29795/3116) JA307K for Air Nippon delivered 21 July 1999.